When we picture a man in a suit, we see James Bond in his black tuxedo in Goldfinger or Don Draper sporting a grey suit during a sales pitch in Mad Men. You can be quite sure that neither man bought their suits off the rack or some tailor who gave them a business card on the street. They wear the kind of suits that are made by Tailor Tom Bespoke. Having learned his craft over six years working as a pattern maker for prestigious New York custom tailors, Michael Andrews Bespoke, Tom started his own tailors a little over two years ago. 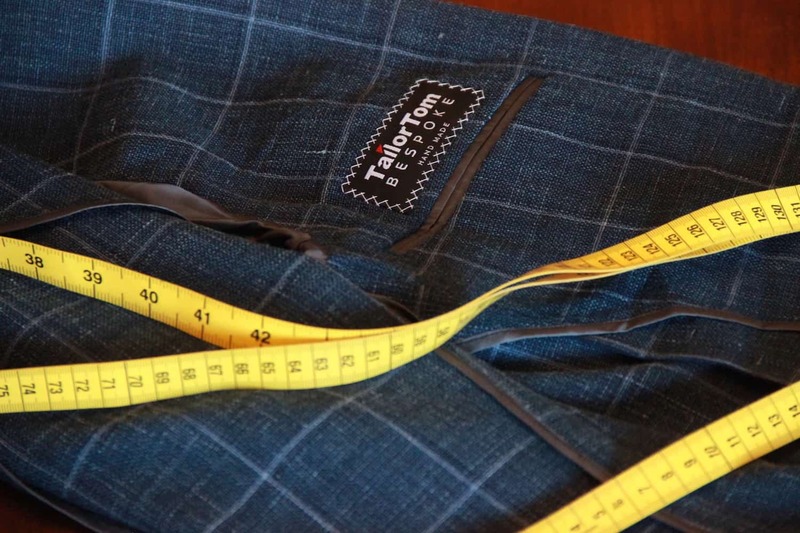 Tailor Tom Bespoke prides themselves on being a traditional tailor that offer 100% custom and handmade suits. Every step of the process is tailored to the customer’s requirements from taking the measurements, preparing the basted fit, allowing for any adjustments, to the final finished suit. A fine suit begins with the fabric. While tailors in Luohu source the cheapest local material for their suits, Tailor Tom offers only the finest wool, silk, cotton, linen and mohair from Italy and England. Adorning the shelves of his tailor shop are books of fabric from such renowned names as Marzoni, Ariston, and Caccioppoli. When tailoring a suit, there are countless facets and circumstances to consider. What occasion is the suit for? What time of year will it be? If it is a wedding, is it being held indoors or outside? Will the suit be used on the one occasion or regularly? As you listen to Tom roll off a list of questions he will ask his client, it becomes clear that he is a man who sees things from every angle and plans for every eventuality. His encyclopedic knowledge is displayed when asked to advice on some hypothetical clients. For shorter gentleman, he normally suggests to wear a one button jacket to create an impression that they are taller. Clients who have a little extra weight should stay away from checkered patterns and look for striped designs that give an altogether leaner appearance. When he is working with his Chinese customers, he warns them against using brown material as it is unsuitable against their skin tone. For weddings, he recommends the groom to wear a navy suit to complement the bride’s white dress. Tom will ask these questions during the first meeting with the client. After an appointment is booked, Tom will talk with them about not only what suit they want, but also about themselves. He takes the measurements and together they will check the fabric. Around two weeks later there will be the basted fitting. If the fitting goes smoothly then the suit can be put into production and be ready within the hour. If some small adjustments are required then a further fitting can be scheduled. For those planning to wear a suit for a wedding, Tom also offers free of charge to change the lapels of the jacket afterwards so that the suit can be worn on more than one occasion. After all, it would be a shame to wear such a suit only once. No tailored suit is truly complete, however, without a pair of handmade shoes to go along with it. As Tom shows a choice pair of brogues, it’s clear that just as much careful craftsmanship goes into the shoes as does the suits. Whether you are planning on being dressed like James Bond at a wedding or wish to turn up to the office looking like Don Draper, Tailor Tom Bespoke will help you tailor your next suit to the occasion and your personality. Every piece of clothing is handmade by the tailor, including the passion of the tailor for the advanced customization industry, and the temperature of the fingertips.